So it happens. What happens you may be asking? Life. We work. We play. We work. We play. …and somehow life goes zooming by – or at least that is the case for us at times. Where did the time go? We were just teacher candidates ourselves and preparing to change the world – one student at a time. Now here we are – just a few years older 🙂 – and preparing teacher candidates to change the world one student at a time. How can we learn to enjoy life – both work and play – while time goes zooming by? We think we have the answer to this one, and it can be learned in ORG 101 – Organization for Living and Leading. The central focus here is a healthy combination between organization and appreciation. If we can maintain a fresh perspective and enthusiasm for what we do daily, we can enjoy life and appreciate that is truly is a gift. Our perspective impacts our families, our colleagues, our students, and almost anyone and everyone we meet. Sometimes it is challenging to maintain that positive outlook when all we see when we look up is a mess. Where are we going with this you may be wondering? We will aim to get organized here and share our thoughts. 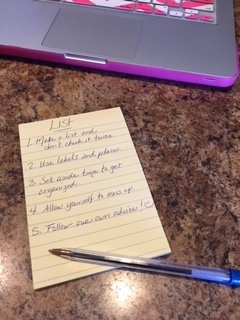 With the craziness of the end of the school year approaching, we tend to miss the big picture at times and focus on the small things on the to-do list – and miss life happening in the mean time. We need to remember to slow down and stay calm. We need to remember to appreciate life – both work and play. We decided to set a goal that we can accomplish while the end-of-the-year rush is underway. We decided to get organized – and appreciate. I remember being “hyper organized” per my students. When I was in my own classroom, I had labeled each cabinet door or drawer with a number. Inside my sub, or guest teacher, notes, I had lists of what was located in each drawer or behind each drawer. If someone opened a drawer or door, the lists could be found there as well. When I would ask for student feedback throughout the year, I would get “She is kind…and hyper organized.” I guess I took that as a compliment – that, and my students seemed to be learning. Get organized. Stay Organized. Revaluate Organization. Repeat as Needed. Sometimes when we are busy living, we can get out of sync and feel as though we are failing ORG 101 – even if we passed that class years ago. One of the key components here is to find what works for you. A technique that works fabulously for your colleague or friend may not work for you. Be yourself on the road to organization so you can succeed at it – and in return appreciate life – both work and play. 1. Make a list and don’t check it twice. Some of us – without naming names – were notorious for making a list of our list. (Just ask my husband!) Instead – find a method of “list making” that works and stick to it. Try not to stray away from it until you have given it 100% effort. I have learned to categorize tasks and prioritize them by deadlines. Although my preference is not to work by deadlines, it sometimes is the way life goes. The important thing to remember here is that the word deadline does not need to be stressful. Do your best and ask for help if needed. 3. Set aside time to get organized. If you don’t have the time to appropriately file or tend to papers and mail, set aside specific time/s during the day to pay attention to those details so that you can be efficient. This cannot happen overnight – unless you take a sick day and hide out cleaning and organizing. 4. Allow yourself freedom to mess up. We can hear negative thoughts often enough from others without constantly berating ourselves for not living up to our own expectations. After all it is only life. We have been given a gift so although we aim not to mess it up, we appreciate the learning that happens when we do. If we can model this for our own families and students, we are half way there to accomplishing great things!